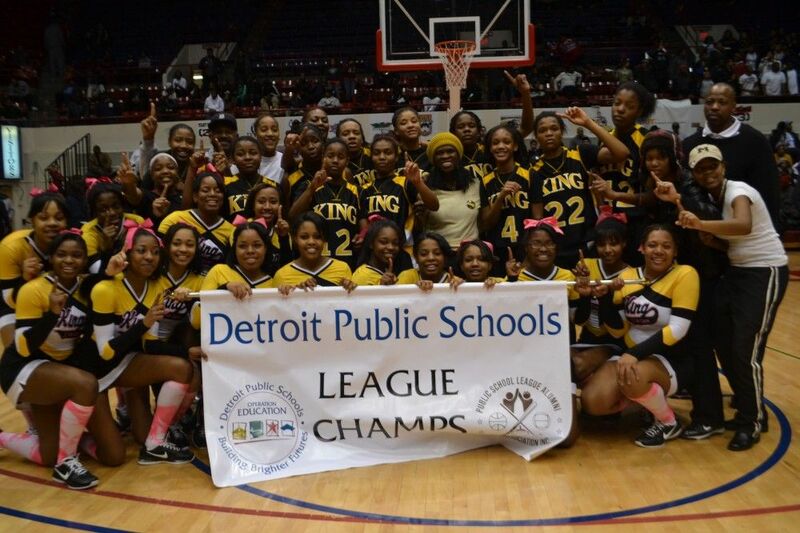 King High was crowned king and queen of Detroit Public School League basketball Thursday at University of Detroit Calihan Hall where an estimated 3,000 fans saw the Crusaders and Lady Crusaders win both ends of a Big D tournament championship doubleheader against No. 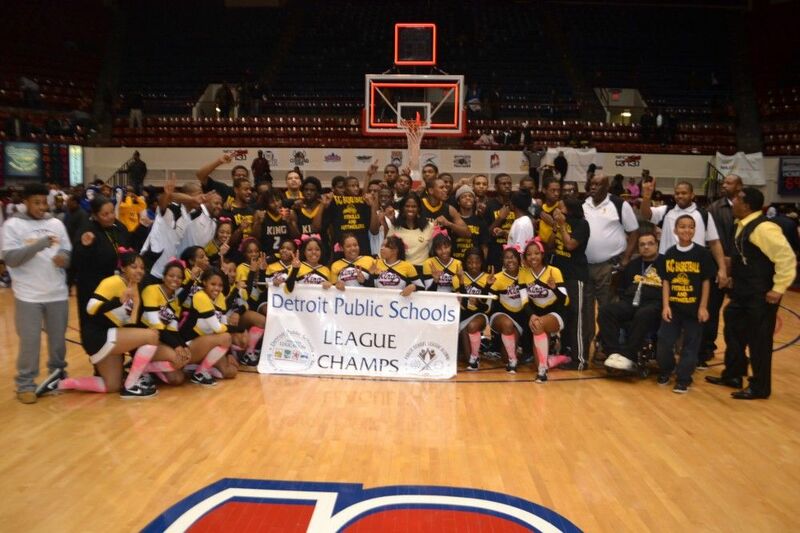 1-ranked Pershing High. Coach William Winfield’s Lady Crusaders (17-2) started off a black-and-gold night of celebration with a 50-47 victory against Coach Shawn Hill’s Doughgirls (16-2). Coach Pierre Brooks’ Crusaders (15-4) finished off the upset sweep with a 76-69 victory against Coach A.W. Canada’s previously unbeaten Doughboys (18-1). Takira Height, a 6-2 junior, came off the bench to score 18 points for King’s girls, who claimed their first PSL championship since 2006. The championship was the 16th in Winfield’s storied tenure at King, which had lost to Pershing earlier this season and snapped a seven-game losing streak against the Doughgirls. 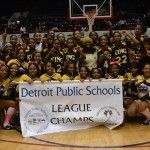 Pershing’s Caprice Dennis, who was named Ms. PSL basketball at halftime and is ranked the top player in the state, was held to just five points and was never able to get into her shooting groove, due mostly to Height’s tough defense. Nijzah Hill led the Doughgirls with a game-high 27 points. In the boys’ championship, Malik Albert, a 6-2 senior, scored 16 of his game-high 29 points in the fourth quarter to ignite King’s first boys’ PSL basketball championship since 1999. William Abbott added 12 points and 13 rebounds as the other key player in the Crusaders’ upset. Veyon Bentley scored 18 points and Kahlil Felder scored 16 for the Doughboys, who trailed just 70-66 with 40 seconds remaining but committed a turnover and a foul that sent Albert to the line where he sank two free throws to ice the game. Pershing’s top two scorers were held in check. Senior Sherron Dorsey-Walker, who is headed to Iowa State next fall, scored just 12 points and junior Martez Walker had seven. With their hard-earned PSL championships in tow, King’s boys and girls will represent the league against the Catholic League champions when they return to action. 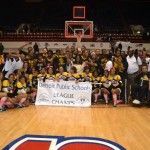 The girls’ Operation Friendship game is slated for Thursday, Feb. 23, at Dearborn Divine Child. Pershing’s girls will play the Catholic League runner-up in the 5 p.m. consolation game, followed by King vs. the Catholic League champion at 7 p.m. in the title game. The boys’ Operation Friendship game is scheduled for Thursday, March 1, at Cass Tech High School. Pershing will play the Catholic League runner-up at 5 p.m., and the Crusaders will play the Catholic League champion at 7 p.m.